Researchers in association with The University of British Columbia, The Hospital for Sick Kids and Bloorview Children’s Hospital recently published a study in the journal Science Translational Medicine regarding a possible link between brain development and slower growth in preterm infants. The study suggests the cerebral cortex may play a part in delayed growth. The study used MRI scans performed at birth and near suggested due date for 95 preterm infants. 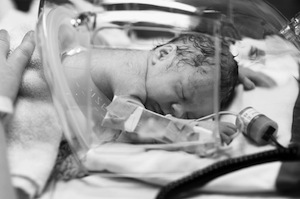 All infants were born at the BC Women’s Hospital from 2006 to 2009. Scans showed water movement through the brain. As the brain grows and the infant ages, water movements change. Also noted were weight, length and head circumference. What researchers found exciting was the difference between term and preterm infant brain scans. Preterm infant scans showed slower growth in the cerebral cortex when growth was restricted. In infants with no restricted growth, the cerebral cortex developed as expected. Researchers believe the brain scans and study results could be the starting point for future study into the role of the cerebral cortex, brain development and growth in preterm infants; this coud eventually lead to treatments to promote optimal growth independent of gestational age at birth. While this part of the study is complete, researchers continue to follow the preterm infants. The study will not expand into childhood where researchers hope to learn more about the impact of preterm birth on brain development later in life. Dr. Steven Miller, study co-lead, suggests the study will “lead to new discoveries that will help us optimize their brain development.” There is no mention of how many families will continue to take part in the study in the next phase of childhood development.